Welcome to the User Page of Andymii! This user is a former Fun Stuff Director for the 'Shroom. This user is a former Poll Committee Chairperson. This user is an very good gamer. This user's favorite ally is Yoshi. This user's favorite enemy is Lakitu. This user enjoys playing the piano. This user owns a vast amount of Mario-themed plush toys! This user likes being on the Grammar Police. This user has won 2 Mario Awards from The 'Shroom! This user has won 2 Luigi Awards from The 'Shroom! This user has won a Bowser Award from The 'Shroom! This user has won 4 Peach Awards from The 'Shroom! This user has won 3 Toad Awards from The 'Shroom! Hello, everybody! I'm Andymii, and welcome to my user page! I'm a former 'Shroom Fun Stuff Director and Poll Committee Chairperson, so if you want to contact me, feel free to do so on my talk page. First Mario Game: Mario Kart: Double Dash!! First Virtual Console Game: Super Mario Bros. This section is constantly being updated, as I will only store up to 3 bullet points per list at any given time. More recent happenings are higher, while earlier ones are lower. The pages I founded as of now are the following, not including redirects. For a game to reach 100% status, I have eight rules. Feel free to use these intentionally exaggerated rules as your own guidelines as well if you want the most out of your game. Every possible level, stage, or objective must be beaten. Every collectible must be obtained unless nine or more of each item can be collected, in which case only one of each collectible has to be obtained. However, if collecting a certain amount unlocks something, then you have to collect that amount. Scores of any kind do not need to be maxed out unless doing so unlocks something. All achievements must be unlocked. Temporary achievements (such as the Gold Steering Wheel in Mario Kart 7) can be ignored. All game modes must be played, excluding easier versions of levels that unlock nothing more or different when compared to the original level. If given a choice, games must be beaten on the tougher mode from the start. Non-game assist tools and using restore points on the Wii U and 3DS Virtual Console games are prohibited, though quick-save states (save states that save and close your game, then delete it immediately once the game opens again) used for the purpose of the prevention of loss of progress are allowed. 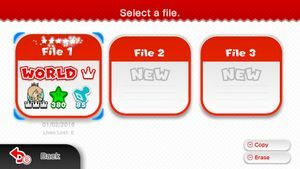 Tools can only be used if they are part of the game, though if one causes a permanent penalty of any sort (such as Super Guide from New Super Mario Bros. Wii/New Super Mario Bros. U, which permanently removes the shiny stars from the account profile), it is prohibited. Maps and game guides are allowed, along with watching walkthroughs online. Below is my personal list of games covered by the Mario Wiki that I have beaten 100%, based on the rules above. Beaten August 19th, 2014 (Wii Virtual Console Version). Beaten October 26th, 2014 (3DS Virtual Console Version). Beaten Thanksgiving, October 27th, 2014 (3DS Virtual Console Version). Beat January 9th, 2015 (3DS Virtual Console Version). Beaten February 4th, 2015 (Wii Virtual Console Version). Beaten Christmas Eve, December 24th, 2015 (Wii Virtual Console Version). Beaten April 9th, 2016 (3DS Virtual Console Version). Beaten June 26th, 2016 (Wii Virtual Console Version). Beaten August 4th, 2016 (3DS Version). Beaten August 28th, 2016 (3DS Virtual Console Version). Beaten March 10th, 2017 (3DS Virtual Console Version). Beaten August 24th, 2017 (DLC Version). Super Mario 3D Land: This was beaten with zero lives lost. It is quite an easy game. Super Mario Galaxy 2: While generally just right in difficulty, the Perfect Run was a welcome challenge. I beat that level with my brother as the Co-Star Luma. Super Mario Galaxy: Yes, I beat Super Mario Galaxy before Super Mario Galaxy 2. Personally, this is my favorite game of all time. Super Mario 64 (Wii Virtual Console Version): This is my favorite Virtual Console game. Some levels were quite hard (Rainbow Ride's 100 coin run comes to mind), but that is part of what makes it such an awesome game. Super Mario Land (3DS Virtual Console Version): Beating this is not too hard, though it is annoying that you have to start all over if you get a Game Over and burn all your continues. I beat this in hard mode as well. New Super Mario Bros.: This game is very easy. I beat it completely in about a month. Super Mario Bros. 3 (3DS Virtual Console Version): World 8 is brutal. Thank goodness for continues! Bowser was easy to defeat, though. Super Mario Land 2: 6 Golden Coins (3DS Virtual Console Version): While extremely easy overall and quickly stacking up 99 lives, the final level is perhaps the biggest difficulty spike I have ever experienced. Super Mario Bros. (Wii Virtual Console Version): World 8 was so difficult that I had to resort to turtle-tipping. I did not use Warp Zones, and I beat this in hard mode as well. Mario Kart 64 (Wii Virtual Console Version): The game was extremely short, and the unlimited amount of redos made it easy to get golden trophies. The controls are sensitive, however. New Super Mario Bros. 2: This has got to be the most tedious game I have beaten 100%. I had to first beat the main game completely, then beat all the DLC packs, meeting the coin target every time (including the Impossible Pack). And yes, I had to buy them all, which cost $25; the game itself only cost $19.99. Then I had to beat all the StreetPass challengers (then "favoriting" them all so no more other Streetpass data could come in, but mine could go out). And to top it off, I had to collect 9,999,999 coins, a feat only made possible by a coin trick on level 3-4, a level I received on StreetPass. Whew! Well, that's finally done. Super Mario 3D World: This game was incredibly easy. Beating each level with each character to get the final Stamps sounds tedious, but was actually a lot of fun. Champion's Road is not nearly as hard as people say; all you need is to bring a Tanooki Leaf and a Lucky Bell, and the level is not hard. I beat it in five minutes the first time I tried, and doing it with five characters took no time. Mario Kart DS: Getting a three-star rating on all Grand Prix and missions was difficult. At times, it felt cheap, even for Mario Kart. The rubber band effect is still very prevalent in this game, and the Spiny Shell is much more common than other Mario Kart games. Additionally, deploying an item doesn't even guarantee protection from Red Shells; in this game, they sometimes attack you from the side. Unlocking the Staff Ghost time trials was very easy, though. New Super Mario Bros. Wii: When I first played this game when I was younger, I was really bad. I had trouble in levels in World 1 and racked up 99 Continues. I somehow made it to the final boss fight, which was near impossible for my brother and I. After a few years of not playing it, I started the game from the beginning, where I found the game suddenly was much easier. The Bowser battle wasn't even nearly as hard as before. I guess I've really improved over the years. Captain Toad: Treasure Tracker: For a puzzle game, Captain Toad: Treasure Tracker was very easy. Other than Mummy-Me Maze Forever, I cannot recall a single level I was stuck on. In fact, I had so much time that I tried to collect as many coins as possible in many levels. Donkey Kong Country: I got this for my New Nintendo 3DS. The game was challenging in places but was still very short. Although the bosses are pathetically easy, some of the Bonus Stages are very hard to find, sometimes even located in unfair locations. The game itself is beautiful; the fact that this game was pulled off on a Super Nintendo is amazing, and the game is plenty of fun even today. Photos with Mario: It's not exactly what comes to mind when one thinks of a game, but I consider this application beaten regardless. I've been playing many eShop games, and I found that the Photos with Mario cards to be a fun collection I could get at the same time. A majority of the eShop funds went towards getting all the New Super Mario Bros. 2 DLC. Getting a group photo of all the cards was how I considered the game beaten, but I still mess around with the game once in a while, because it is still fun to put the cast of characters in real-life locations. Super Mario Sunshine: After first playing this in a hotel, I decided to get this game from eBay. I enjoy 3D Mario games, but Sunshine is very different from the others. Due to the inclusion of F.L.U.D.D., platforming is mostly secondary. While I would not want it to replace the solid platforming of other Mario games, I actually quite enjoyed the greater control brought on by a water-powered jetpack. Collecting all the Blue Coins was a lot less interesting than it sounded, though, and I mostly used the Super Mario Wiki as a guide for finding them and ultimately complete my profile with 120 Shines. Super Mario World: Because I have to use a GameCube controller to play, the controls of this game are pretty awkward. However, I got used to it fast. The strange thing about Super Mario World is that its goofy graphics are perfectly acceptable today. With Dragon Coins, Secret Exists, Ghost Houses, and Ninth Worlds, it almost felt like I was playing a New Super Mario Bros. game. Although the game seemed difficult early on, I later improved. Levels such as Tubular took no more than half an hour to beat. WarioWare: Touched! : I got this through the My Nintendo program, surprised that they would give such a big game away pretty much for free. It was my first time playing a WarioWare game. Most of the microgames were at a fun and exciting pace when shuffled, although playing each microgame over and over again became somewhat tedious. The microphone games were also less fun than the rest. However, the Toys are actually really interesting to play with; some of them, such as the Metronome, became actually useful when I was on the road. Donkey Kong Country 2: Diddy's Kong Quest: This game was much harder than Donkey Kong Country. I also found it to be much more fun – the bonus rooms were challenging but reasonable to find, and the difficulty never felt cheap. Everything could be done through trial and error. I beat it while in a hotel on a trip to Washington, D.C.
Mario Kart Wii: This was one of my first Mario games. After picking it back up recently, I can finally say that I beat it! Getting three stars on all Grand Prix cups was just as hard as Mario Kart DS. While computers aren't inexplicably faster than players anymore, there are a few nitpicky things that were somewhat annoying. When you press the "use item" button to deploy an item, there is a slight delay between the button being pressed and the item actually getting deployed. As such, I was often hit by Red Shells even though I had an item on hand. Also, because I play with a GameCube controller, it was more difficult to deflect POW Blocks, wheelie, and pull of tricks, since I had to move my left thumb off the joystick for a brief second. Donkey Kong Country 3: Dixie Kong's Double Trouble! : This game's music and atmosphere were not as good as Donkey Kong Country 2, but Donkey Kong Country 3 is still a pretty decent game. Not until I had reached the final boss did I realize that the only way to get a complete 105% profile was to use the TUFST code, which meant I had to start over from the beginning. However, even though I was playing with no midway points and barely had any DK Barrels the second the around, I did much better. I'm not sure why they introduced the character of Kiddy Kong when they could have easily used the more recognizable Donkey Kong, but I guess that's a nitpick. I made sure to activate all the cheat codes that did not penalize my account. New Super Mario Bros. U + New Super Luigi U: Beating my this game, my first for Wii U, took over four years. I beat the main game on August 3rd, 2014, while in a hotel in Anaheim (we had brought our Wii U to our hotel outside Disneyland). I prematurely considered this game completed 100% for a short time (I even put it on this very list), until, to my dismay, I realized that I had forgotten a crucial part – Challenge Mode! Challenge Mode was so difficult, I nearly gave up on this game. The Boost Mode Challenges were especially difficult because I had to find time to do them with my brother (who is quite adept at placing Boost Blocks, by the way). Not until earlier of August 2017 did my brother and I finally complete every single Challenge. After finally beating the New Super Luigi U DLC with a perfect profile today, I can finally say with confidence that I've beaten all this game has to offer. Mario Kart 7: This game was pre-installed in my 3DS when I got one way back in 2012. In total, it took about 5 years to eventually beat it – mostly due to the difficulty in unlocking the Gold Standard. Because I could only collect up to forty coins in a Grand Prix, collecting 20,000 took a very long time, making this game even more tedious to complete than New Super Mario Bros. 2 and its 10-million coin challenge. Super Mario Run: This game was, for the most part, very easy. Getting 50,000 Toads to unlock the Peach Tent was no easy endeavor, however. And getting all the rare Gold Statues from Remix 10 was quite satisfying. On the Super Mario Wiki, I try to fix errors and typos whenever I see some or add information whenever it is missing. I also like to format and make pages more reader-friendly and vote and create proposals for ways I think can improve this website. I also am always on the lookout to remove as many word contractions (e.g. he'll, won't) as possible. They simply are not formal, and while contractions are great for pretty much everything else, I do not believe they should belong on an encyclopedia, even if it is about a video game series. This job is nonstop; it is amazing how many contractions are on this website.